FireFlies Audio LLC, a Utah-based consumer electronics company, announced the launch of their new wire-free earbuds (www.FireFliesAudio.com). The FireFlies are among the first truly wireless earbuds to be released and provide a comfortable fit and great audio performance. However, unlike similar products announced, FireFlies don’t cost $300–instead they are being offered for only $79 – a price that everyone can now afford. “It was a massive challenge to hit this price point, but the goal was for people to be able to experience wire-free music with great sound quality without having to spend a fortune. The average person can now afford wire-free earbuds that enhance their active lifestyle,” said Eric Child, Co-founder of FIREFLIES AUDIO. 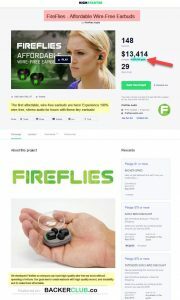 FireFlies are currently available for preorders on Kickstarter at $79 for the first 1000 backers. After that, the price will move up to $99 – still a fraction of the cost of the closest competitor. This article was posted in Design and tagged @firefliesaudio.com, #wearables, #wireless, earbuds, earphones, headphones. Ahaa, its pleasant discussion about this paragraph at this place at this blog, I have read all that, so at this time me also commenting at this place.